Join the discussion on our forums! Come discuss Cloning Device over in our dedicated Cloning Device discussion topic. Discover a copy of a minion in your opponent's deck. Zerek got sick of fighting over the remote. I didn't even know this card existed until I saw it in a video... once ever. Not even when I was watching Boomsday spoiler season. Ah another addition to my thief priest! Pretty bad, does give you some info but vs aggro this is usually going to give you a selection of little garbage synergetic minions. Vs control it's going to give you some combo piece you can't use. It's ok in arena if you're in top deck mode but still way too anti tempo. Operative you're paying only 3 mana for the 5/6 body and you get to discover spells which are generally more useful than minions. Drakonid Op without the "drakonid" part... and without the "op" either. You get to possibly steal a good minion and get an idea of what your opponent's strategy is. Pretty solid card. That joke is as viable as the card itself. It wasn't so much as a joke as much as it is something I'll have slight paranoia over when I actually do that. I don't know. It seems better than Thoughtsteal and worse than Drakonid Operative. Also the fact that it can only be a minion makes it so much worse. Also mostly horrible against combo and zoo like decks. I immediately got traumatizing flashbacks to Drakonid Operative when I saw this card. I want to make it clear that I believe this card will see little to no play, outside of Kripp's Thief Priest deck at the start of the expansion, but you have to realise that this card will be the source of great highlights. 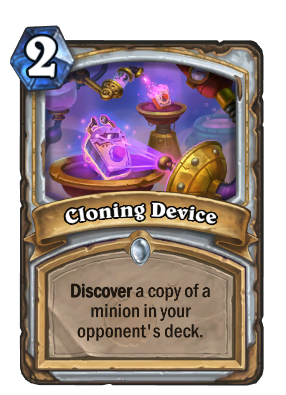 Due to the next patch, this is gonna be able to copy the card even with an enchantment, meaning you could get a minion with the +1/+1 from Prince Keleseth, or even a 7/5 Dire Frenzyd Huffer. I think it should be usable in arena, but really should have been 1 mana. My Jaws that bite, my claws that catch! It will see as much play as Blazing Invocation had (almost nothing). Maybe useful if got from Lyra the Sunshard but I think no one is going to use a card slot for this. Seems like it can be counter... question is, to what exactly? This card should cost 1 to be playable. I don't understand why this is even being given the light of day, this is absolutely without a doubt easy dust and nothing else. This card should have Echo in my opinion for it to be usable. Why give Rogue Pick Pocket that has much more potential than this and not give this card echo also. I do think Thoughsteal is better than this card, because with highroll Thoughtsteal can get you a hero card (Frost lich jaina anyone ?) and a very strong spell/ minions from your opponent . This card only get you a minion, so very bad against fast and combo deck already.